This article was written by Vernon C. Morgan. Vernon is a full-time stylist and part-time personal shopper with a degree in communications and a dream of transforming the fashion industry for the better. When she’s not working, Morgan enjoys yoga and live jazz. For as long as the fashion industry has existed, plus sizes have suffered under a hurtful stigma. On the runways and through store windows, only so-called straight sizes have dominated the industry and received mainstream coverage. And like we previously talked about here on 21squared, social media’s equally unrealistic standards when it comes to beauty doesn’t really help, either. The overall effect of this has been to drive those who do not fit into this narrow mold to hide themselves in shame, having no recognition or representation to validate their existence. Indeed, the first step towards change is erasing the fine line that divides plus size people from the norm. “Plus size” clothes are just clothes, after all, and it’s time we all start acknowledging that instead of boxing them into their own extraordinary “other” category. Beyond that, there are also the barriers to production that hinder the mass-distribution of plus size clothing in the first place. True enough, the Washington Post explains that there’s more to plus size fashion than simply sizing up a pattern. The intricacy that goes behind designing a properly fitting garment can get extensive, and variations in body type can be challenging to design under standard industry practices. Of course, this is all despite the fact that plus sizes are undeniably the larger demographic out there. Studies reveal that the average size of an American woman is now between 16 to 18. 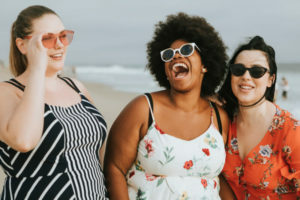 To put things in perspective, body positive women’s site Woman Within has always defined plus size as clothes ranging from sizes 12 to 44. These are sizes that one would be hard-pressed to find in your typical clothing store, prompting the rise of independent plus size designers and retailers online. It’s extremely telling of how skewed our relationship with larger clothes are, given the limits on mainstream accessibility. Despite the demand, CNN Business writer Nathaniel Meyersohn notes that retailers have been sitting on a goldmine worth $21 billion, which they’ve been ignoring for years. But now, key movers and shakers in the industry aren’t just giving them recognition — they’re actively courting them, too. From contemporary womenswear brands like Reformation to mainstream giants like Walmart, companies are beginning to expand their size ranges and highlighting plus size women. Some brands have even taken the lead, such as Rihanna’s Savage x Fenty. The singer’s lingerie line was met with wide acclaim, mostly for its emphasis on diversity and inclusion. Inclusion, of course, is so much more than just selling clothes in larger sizes. It entails pushing them into the mainstream — with the same array of styles and price points as their petite counterparts. It means knowing that representation isn’t just a marketing ploy when you showcase models of all shapes and sizes. Only then will we see the day when what was once a segment reserved for the back of the store is now showcased proudly front and center.